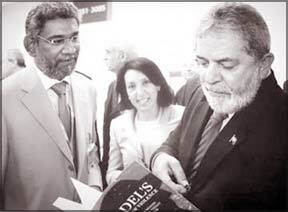 President Lula da Silva of Brazil perusing Dr. Jayatilleka’s book Fidel’s Ethics of Violence: the Moral Dimension of the Political Thought of Fidel Castro. While Dr. Dayan Jayatilleka and Ambassador Maria Nazareth Farani Azevedo of Brazil look on. Dr. Dayan Jayatilleka will leave Geneva for Colombo this weekend having served as Sri Lanka's Ambassador/Permanent Representative to the United Nations in Geneva since June 1, 2007. August 20 was his last day of service in that post. During his tenure he served as Chairman of the Governing body of the International Labour Organization (ILO), Vice President of the UN Human Rights Council (UNHRC), Chairperson of the Inter-Governmental Working Group (IGWG) on the Effective Implementation of the Durban Declaration and Program of Action, Coordinator of an agenda item of the Conference on Disarmament (CD), Facilitator/negotiator for the Asian Region at the Durban Review Conference against Racism, and Coordinator of the Asian Group of the UN HRC as well as the UNCTAD.